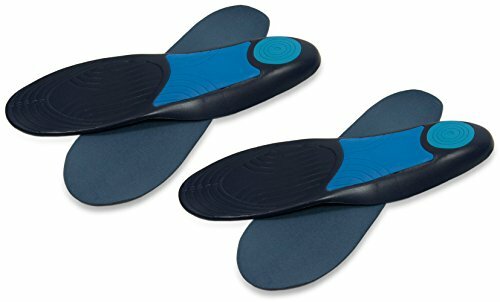 Trek Support Plantar Fasciitis Insoles are the solution for painful heels due to plantar fasciitis. If you suffer from plantar fasciitis, you know how this condition can get in your way of daily living. A simple run to the supermarket or picking the kids up from school becomes a painful excursion. How does this insole work to relieve the pain? The semi-rigid arch lifts the plantar fascia and takes pressure off painful heels. The soft top layer of foam cushions and supports the full length of the foot. Our team of foot experts added a shock-absorbing gel cushion in the heel area for an added layer of protection and a velvety-soft top fabric to soothe sore feet. This insole is trimmable to your shoe size and designed to be worn in athletic running shoes and sneakers, work boots, casual and dress shoes. Don’t let the pain of plantar fasciitis get in your way of staying active. Insert insole into shoe fabric side up. If needed, trim using guide on underside of insole. TIP: Initially trim to one size larger than your shoe size. Start by testing for fit ON TOP of your existing insole. If the fit is too tight, remove the insole that came with your shoe. In most shoes, the original insoles are removable. Replace after six months for best comfort and support. If you have any questions about this product by Trek Support, contact us by completing and submitting the form below. If you are looking for a specif part number, please include it with your message.